Arati the design label came into being in 1995, when Arati Monappa, who had been interacting with different groups of crafts people, purely as a matter of interest found that they needed design direction & marketing help. It started on an informal basis, but when the cooperative effort between designer & craftsperson yielded results that were accepted by design stores, Arati decided that it would suit her purpose if the association could help improve the living standards of the people she employed. Thus it became a two pronged exercise. It kept her creatively involved, provided workers with fair wages & education for their children, & in addition a share of the profits was invested in basic infrastructure for their craft-in the case of hand block printers, suitable printing tables were provided free of cost, which belonged to them & which they could utilize for other clients. In 1996 Arati ventured into a home furnishing line, using the same natural fabrics & craft techniques, which was also exported. However, since most fabric is especially dyed/ printed with natural colours or accessorized using labour intensive craft techniques, production is limited. Every sari is one of its kind & unique in its design. Even at exhibitions there are never more than fifty saris displayed at a time. In 1997 the Silk Export Promotion Council used Arati’s samples in its design collection at the prêt a porter in Paris. In 2000 Arati was one of the winners of the Kingfisher Fashion award for design in the south. The Arati label is low profile as there is a deliberate attempt to cut costs, hence, not too much is spent on advertising so that funds can be diverted to the primary creators-the craftspeople. 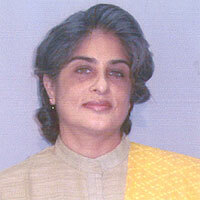 Since 1998 Arati Monappa relocated to Kodagu from Ahmedabad. Her design collection, which earlier retailed from design stores in India & abroad, is now available only at exhibitions or for specific client needs. For the last ten years I have been working with craftspeople who specialize in natural dyes & hand block prints. Both these ancient techniques are fading into obscurity thanks to the efficiency of screen-printing & the laborious process/ uneven results of natural dyeing. I have worked relentlessly, experimenting with different natural fabric, using traditional & geometric prints in a contemporary, arresting idiom to bring vitality into a dying craft. This is because I truly believe we should not lose this charming craft & that with adequate design inputs, it could create a revolution in the fashion world. My design collection whether in clothing, saris or home furnishing is always in a natural fabric, the accent is on simple silhouettes with attention focused on weave, colour & print. Ornamentation is almost always in the form of texture since I feel there are enough competent designers whose forte is embroidery. Apart from my own design collection, most of my work is client specific-blocks, fabric, colours & prints are specially tailored to individual needs. There is a constant endeavor to work with newer fabrics & develop a larger palette of natural shades. This collection for LIFW 03 has garments of organic silk, knitted fabric, georgettes, chiffons, crepes & chanderis, fabrics woven with interesting textures or treated to achieve an ornamentation like quality. Personally my fabric of choice is hand woven khadi silk-the colours of nature & the subtlety of the fabric perfectly express my design philosophy- simple sublime & soul stirring.